The Contact Spray Adhesive is the absolute BEST contact adhesive for Veneers and Edgbanding. Unbranded industrial strength and not generally available for resale. We guarantee you will not be disappointed with the performance of this adhesive. High quality, high tack, high strength. 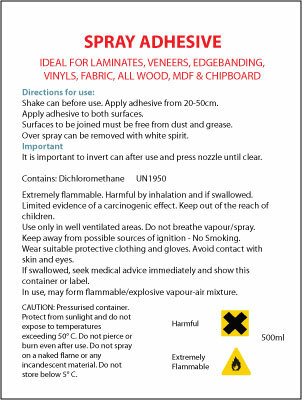 Suitable for use with veneers, edgbanding, laminates, vinyls, fabric, all wood and MDF & Chipboard. Really easy to use spray adhesive. I used this for multiplex edging and it worked perfectly. I would clearly have many other uses. Yes it is very fast acting.